The "Before" pictures show the Slatts 22 I bought in spring of 2003. I decided to modify it and the modifications were significant enough that the designer, John Slattebo, asked me to no longer call it a Slatts. There are no hard feelings, he just feels that it no longer represents his design ideas. He suggested I call it a Magee 22, but that seemed way too pretentious to me. All I did was add a couple of benches and a tiller and move some jib blocks around. So, it's a Different 22. John is currently having success with a new design called the Raptor 16. 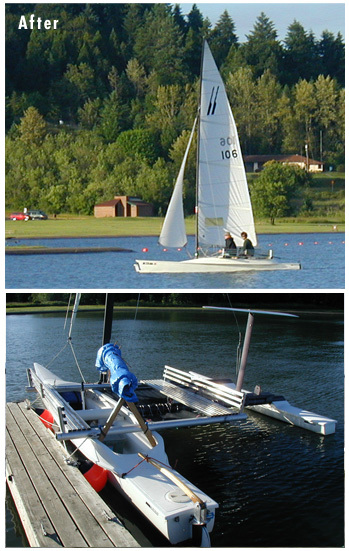 These pictures are taken on Fern Ridge Lake (a reservoir lake, sailing from March to October only) outside Eugene, Oregon. It's the second biggest lake in Oregon. Winds tend to be light, averaging 5 to 15 mph in the late afternoons. Night sailing is often very nice, with steady breezes. 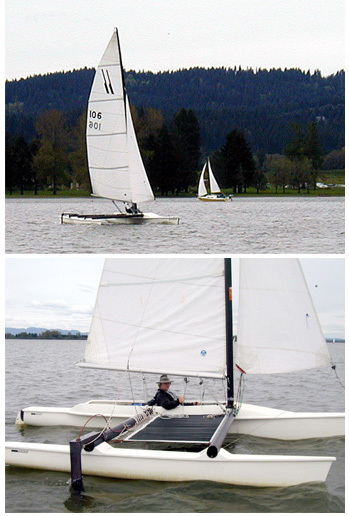 The boat is a tacking outrigger with a hydrofoil to help keep her sailing flat. Basically, it pulls the outrigger float down when on starboard tack, and lifts it when on port tack. It steers with rudder pedals and all controls come to the front seat. I decided to modify the boat by adding beams that support port/starboard benches, and a tiller. I simply didn't like the "sitting down in a cockpit" position. Small, light boats sail better, to my mind, when you can move your body around to change trim. Now my body counteracts some of the heeling forces, but the hydrofoil is still very useful. It allows you to really fine-tune the heel of the boat, affecting speed and also the ability to point higher. It's definitely not as "clean" looking, but I'm having more fun with it because I lost the "trapped" feeling I got from sitting down in the cockpit. My wife also prefers it because it's easier to have conversations, and rather than simply sitting in the back seat doing nothing, she can work the jib sheets or more easily switch to the helm position.